This name uses Eastern Slavic naming customs; the patronymic is Abelevich and the family name is Kaufman. Dziga Vertov (Russian: Дзига Вертов, Ukrainian: Дзиґа Вертов; born David Abelevich Kaufman, Russian: Дави́д А́белевич Ка́уфман, and also known as Denis Kaufman; 2 January 1896 – 12 February 1954) was a Russian Soviet pioneer documentary film and newsreel director, as well as a cinema theorist. His filming practices and theories influenced the cinéma vérité style of documentary movie-making and the Dziga Vertov Group, a radical film-making cooperative which was active from 1968 to 1972. 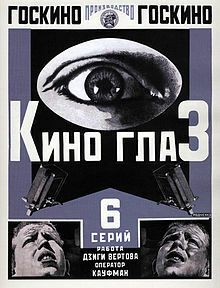 In the 2012 Sight & Sound poll, critics voted Vertov's Man with a Movie Camera (1929) the 8th best film ever made. Vertov's younger brothers Boris Kaufman and Mikhail Kaufman were also noted filmmakers, as was his wife, Yelizaveta Svilova. Vertov was born David Abelevich Kaufman (Russian: Дави́д А́белевич Ка́уфман) into a family of Jewish lineage in Białystok, Poland, then a part of the Russian Empire. He Russified his Jewish name David and patronymic Abelevich to Denis Arkadievich at some point after 1918. Vertov studied music at Białystok Conservatory until his family fled from the invading German Army to Moscow in 1915. The Kaufmans soon settled in Petrograd, where Vertov began writing poetry, science fiction, and satire. In 1916-1917 Vertov was studying medicine at the Psychoneurological Institute in Saint Petersburg and experimenting with "sound collages" in his free time. He eventually adopted the name "Dziga Vertov", which translates loosely from Ukrainian as 'spinning top'. Vertov is known for many early writings, mainly while still in school, that focus on the individual versus the perceptive nature of the camera lens, which he was known to call his "second eye". Most of Vertov's early work was unpublished, and few manuscripts survived after the Second World War, though some material surfaced in later films and documentaries created by Vertov and his brothers, Boris Kaufman and Mikhail Kaufman. Vertov is known for quotes on perception, and its ineffability, in relation to the nature of qualia (sensory experiences). After the Bolshevik Revolution of 1917, at the age of 22, Vertov began editing for Kino-Nedelya (Кино-Неделя, the Moscow Cinema Committee's weekly film series, and the first newsreel series in Russia), which first came out in June 1918. While working for Kino-Nedelya he met his future wife, the film director and editor, Elizaveta Svilova, who at the time was working as an editor at Goskino. She began collaborating with Vertov, beginning as his editor but becoming assistant and co-director in subsequent films, such as Man with a Movie Camera (1929), and Three Songs About Lenin (1934). In 1919, Vertov compiled newsreel footage for his documentary Anniversary of the Revolution; in 1921 he compiled History of the Civil War. The so-called "Council of Three," a group issuing manifestoes in LEF, a radical Russian newsmagazine, was established in 1922; the group's "three" were Vertov, his (future) wife and editor Elizaveta Svilova, and his brother and cinematographer Mikhail Kaufman. Vertov's interest in machinery led to a curiosity about the mechanical basis of cinema. Vertov's driving vision, expounded in his frequent essays, was to capture "film truth"—that is, fragments of actuality which, when organized together, have a deeper truth that cannot be seen with the naked eye. In the Kino-Pravda series, Vertov focused on everyday experiences, eschewing bourgeois concerns and filming marketplaces, bars, and schools instead, sometimes with a hidden camera, without asking permission first. Usually, the episodes of Kino-Pravda did not include reenactments or stagings. (One exception is the segment about the trial of the Social Revolutionaries: the scenes of the selling of the newspapers on the streets and the people reading the papers in the trolley were both staged for the camera.) The cinematography is simple, functional, unelaborate—perhaps a result of Vertov's disinterest in both "beauty" and the "grandeur of fiction". Twenty-three issues of the series were produced over a period of three years; each issue lasted about twenty minutes and usually covered three topics. The stories were typically descriptive, not narrative, and included vignettes and exposés, showing for instance the renovation of a trolley system, the organization of farmers into communes, and the trial of Social Revolutionaries; one story shows starvation in the nascent Communist state. Propagandistic tendencies are also present, but with more subtlety, in the episode featuring the construction of an airport: one shot shows the former Tsar's tanks helping prepare a foundation, with an intertitle reading "Tanks on the labor front". Vertov clearly intended an active relationship with his audience in the series—in the final segment he includes contact information—but by the 14th episode the series had become so experimental that some critics dismissed Vertov's efforts as "insane". Vertov responds to their criticisms with the assertion that the critics were hacks nipping "revolutionary effort" in the bud, and concludes the essay with his promise to "explode art's tower of Babel". In Vertov's view, "art's tower of Babel" was the subservience of cinematic technique to narrative, commonly known as the Institutional Mode of Representation. By this point in his career, Vertov was clearly and emphatically dissatisfied with narrative tradition, and expresses his hostility towards dramatic fiction of any kind both openly and repeatedly; he regarded drama as another "opiate of the masses". Vertov freely admitted one criticism leveled at his efforts on the Kino-Pravda series—that the series, while influential, had a limited release. By the end of the Kino-Pravda series, Vertov made liberal use of stop motion, freeze frames, and other cinematic "artificialities", giving rise to criticisms not just of his trenchant dogmatism, but also of his cinematic technique. Vertov explains himself in "On 'Kinopravda' ": in editing "chance film clippings" together for the Kino-Nedelia series, he "began to doubt the necessity of a literary connection between individual visual elements spliced together.... This work served as the point of departure for 'Kinopravda' ". Towards the end of the same essay, Vertov mentions an upcoming project which seems likely to be Man with the Movie Camera (1929), calling it an "experimental film" made without a scenario; just three paragraphs above, Vertov mentions a scene from Kino Pravda which should be quite familiar to viewers of Man with the Movie Camera: the peasant works, and so does the urban woman, and so too, the woman film editor selecting the negative ... "
With Lenin's admission of limited private enterprise through the New Economic Policy (NEP) of 1921, Russia began receiving fiction films from afar, an occurrence that Vertov regarded with undeniable suspicion, calling drama a "corrupting influence" on the proletarian sensibility ("On 'Kinopravda' ", 1924). By this time Vertov had been using his newsreel series as a pedestal to vilify dramatic fiction for several years; he continued his criticisms even after the warm reception of Sergei Eisenstein's Battleship Potemkin (1925). Potemkin was a heavily fictionalized film telling the story of a mutiny on a battleship which came about as a result of the sailors' mistreatment; the film was an obvious but skillful propaganda piece glorifying the proletariat. Vertov lost his job at Sovkino in January 1927, possibly as a result of criticizing a film which effectively preaches the line of the Communist Party. He was fired for making A Sixth Part of the World: Advertising and the Soviet Universe for the State Trade Organization into a propaganda film, selling the Soviet as an advanced society under the NEP, instead of showing how they fit into the world economy. The Ukraine State Studio hired Vertov to create Man with a Movie Camera. Vertov says in his essay "The Man with a Movie Camera" that he was fighting "for a decisive cleaning up of film-language, for its complete separation from the language of theater and literature". By the later segments of Kino-Pravda, Vertov was experimenting heavily, looking to abandon what he considered film clichés (and receiving criticism for it); his experimentation was even more pronounced and dramatic by the time of Man with a Movie Camera, which was filmed in Ukraine. Some have criticized the obvious stagings in this film as being at odds with Vertov's credos of "life as it is" and "life caught unawares": the scene of the woman getting out of bed and getting dressed is obviously staged, as is the reversed shot of the chess pieces being pushed off a chess board and the tracking shot that films Mikhail Kaufman riding in a car filming a third car. However, Vertov's two credos, often used interchangeably, are in fact distinct, as Yuri Tsivian comments in the commentary track on the DVD for Man with the Movie Camera: for Vertov, "life as it is" means to record life as it would be without the camera present. "Life caught unawares" means to record life when surprised, and perhaps provoked, by the presence of a camera. This explanation contradicts the common assumption that for Vertov "life caught unawares" meant "life caught unaware of the camera". All of these shots might conform to Vertov's credo "caught unawares". His slow motion, fast motion, and other camera techniques were a way to dissect the image, Mikhail Kaufman stated in an interview. It was to be the honest truth of perception. For example, in Man with a Movie Camera, two trains are shown almost melting into each other. Although we are taught to see trains as not riding that close, Vertov tried to portray the actual sight of two passing trains. Mikhail spoke about Eisenstein's films as being different from his and his brother's in that Eisenstein "came from the theatre, in the theatre one directs dramas, one strings beads". "We all felt...that through documentary film we could develop a new kind of art. Not only documentary art, or the art of chronicle, but rather an art based on images, the creation of an image-oriented journalism", Mikhail explained. More than even film truth, Man with a Movie Camera was supposed to be a way to make those in the Soviet Union more efficient in their actions. He slowed down his movements, such as the decision whether to jump or not. You can see the decision in his face, a psychological dissection for the audience. He wanted a peace between the actions of man and the actions of a machine, for them to be, in a sense, one. "Cine-Eye" is a montage method developed by Dziga Vertov and first formulated in his work "WE: Variant of a Manifesto" in 1919. Dziga Vertov believed his concept of Kino-Glaz, or "Cine Eye" in English, would help contemporary "man" evolve from a flawed creature into a higher, more precise form. He compared man unfavorably to machines: "In the face of the machine we are ashamed of man’s inability to control himself, but what are we to do if we find the unerring ways of electricity more exciting than the disorderly haste of active people [...]" "I am an eye. I am a mechanical eye. I, a machine, I am showing you a world, the likes of which only I can see", Dziga was quoted as saying. Like other Russian filmmakers, he attempted to connect his ideas and techniques to the advancement of the aims of the Soviet Union. Whereas Sergei Eisenstein viewed his montage of attractions as a creative tool through which the film-viewing masses could be subjected to "emotional and psychological influence" and therefore able to perceive "the ideological aspect" of the films they were watching, Vertov believed the Cine-Eye would influence the actual evolution of man, "from a bumbling citizen through the poetry of the machine to the perfect electric man". Vertov surrounded himself with others who were also firm believers in his ideas. These were the Kinoks, other Russian filmmakers who would assist him in his hopes of making "cine-eye" a success. Vertov believed film was too "romantic" and "theatricalised" due to the influence of literature, theater, and music, and that these psychological film-dramas "prevent man from being as precise as a stopwatch and hamper his desire for kinship with the machine". He desired to move away from "the pre-Revolutionary ‘fictional’ models" of filmmaking to one based on the rhythm of machines, seeking to "bring creative joy to all mechanical labour" and to "bring men closer to machines". Vertov's successful career continued into the 1930s. Enthusiasm: Symphony of the Donbass (1931), an examination into Soviet miners, has been called a 'sound film', with sound recorded on location, and these mechanical sounds woven together, producing a symphony-like effect. Three years later, Three Songs about Lenin (1934) looked at the revolution through the eyes of the Russian peasantry. For his film, however, Vertov had been hired by Mezhrabpomfilm, a Soviet studio that produced mainly propaganda efforts. The film, finished in January 1934 for Lenin's obit, was only publicly released in November of that year. A new version of the film was released in 1938, including a longer sequence to reflect Stalin's "achievements" at the end of the film and leaving out footage of "enemies" of that time. Today there exists a 1970 reconstruction by Elizaveta Svilova. With the rise and official sanction of socialist realism in 1934, Vertov was forced to cut his personal artistic output significantly, eventually becoming little more than an editor for Soviet newsreels. Lullaby, perhaps the last film in which Vertov was able to maintain his artistic vision, was released in 1937. Dziga Vertov died of cancer in Moscow in 1954. Vertov's brother Boris Kaufman was a cinematographer who worked with Jean Vigo on L'Atalante (1934) and much later for directors such as Elia Kazan in the United States who won an Oscar for his work on On the Waterfront. His other brother, Mikhail Kaufman, worked with Vertov on his films until he became a documentarian in his own right. Mikhail Kaufman's directorial debut was the film In Spring (1929). In 1923, Vertov married his long-time collaborator Elizaveta Svilova . Vertov's legacy still lives on today. His ideas are echoed in cinéma vérité, the movement of the 1960s named after Vertov's Kino-Pravda. The 1960s and 1970s saw an international revival of interest in Vertov. The independent, exploratory style of Vertov influenced and inspired many filmmakers and directors like the Situationist Guy Debord and independent companies such as Vertov Industries in Hawaii. The Dziga Vertov Group borrowed his name. In 1960, Jean Rouch used Vertov's filming theory when making Chronicle of a Summer. His partner Edgar Morin coined the term cinéma vérité when describing the style, using direct translation of Vertov’s KinoPravda. The Free Cinema movement in the United Kingdom during the 1950s, the Direct Cinema in North America in the late 1950s and early 1960s, and the Candid Eye series in Canada in the 1950s all essentially owed a debt to Vertov. This revival of Vertov's legacy included rehabilitation of his reputation in the Soviet Union, with retrospectives of his films, biographical works, and writings. In 1962, the first Soviet monograph on Vertov was published, followed by another collection, "Dziga Vertov: Articles, Diaries, Projects". In 1984, to recall the 30th anniversary of Vertov's death, three New York cultural organizations put on the first American retrospective of Vertov's work. New Media theorist Lev Manovich suggested Vertov as one of the early pioneers of database cinema genre in his essay Database as a symbolic form. ^ "Sight & Sound Revises Best-Films-Ever Lists". studiodaily. 1 August 2012. Retrieved 1 August 2012. ^ McClane, Betsy A. (2013). A New History of Documentary Film (2nd ed.). New York: Bloomsbury. pp. 42, 47. ^ "Dziga Vertov". Retrieved 2 January 2018. ^ Paul Rotha (1930). The film till now, a survey of the cinema. Jonathan Cape. pp. 167–170. ^ McLane, Betsy A. (5 April 2012). A New History of Documentary Film: Second Edition. A&C Black. ISBN 9781441124579. ^ "Dziga Vertov, by Erik Barnouw". ^ The technique of film and video editing: history, theory, and practice, by Ken Dancyger. ^ Monaco, James (1991). The Encyclopedia of Film. Perigee Books. ISBN 9780399516047. This page is based on the Wikipedia article Dziga Vertov; it is used under the Creative Commons Attribution-ShareAlike 3.0 Unported License (CC-BY-SA). You may redistribute it, verbatim or modified, providing that you comply with the terms of the CC-BY-SA.